On behalf of the 9,500+ Sons of The American Legion (SAL) members from across the Garden State, we welcome you to the Detachment of New Jersey's website! You will find your virtual visit with us to be very informative and worthwhile. Our very dedicated Detachment officers, commission and committee chairmen invest a lot of time updating their respective pages on the website throughout the year to share with the world what it is that we do to improve the lives of our military veterans, local communities, state, and nation. You will NOT be disappointed, but most likely amazed and inspired by the vast array of achievements from an all volunteer organization. 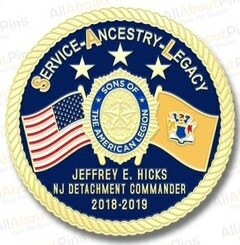 So please be sure to visit with us periodically to catch-up on the latest news and happenings within the Detachment of New Jersey. Enjoy! On Friday, June 8, 2018, at the 57th Annual Detachment Convention in the City of Wildwood, New Jersey, I was honored to be elected by the delegates assembled and subsequently installed by SAL National Adjutant Anthony W. Wright (PA) to serve as the Detachment Commander (State Commander) for The Sons of The American Legion, Detachment of New Jersey. Needless to say, it was a very humbling moment and a very moving experience that will forever remain in my heart! A most sincere THANK YOU to the Detachment membership for entrusting me with such a distinguished office. Rest assured, I pledge to give the job my very best efforts to produce for you another successful year in the storied history of the Detachment of New Jersey! In case you are not familiar with me, I will share some brief background about myself. The 2019 SAL membership year marks my 14th year as a member in the Sons of The American Legion. My home squadron is Guy W. Doron, Sr. & Jr. Squadron #526 located in Southampton Township, Burlington County, New Jersey. Three (3) generations of veterans in my family honorably served the United States of America through their military service--my maternal great-grandfather the late Legionnaire Guy W. Doron, Sr.,(American Legion Post #11 - Mt. Holly, NJ) a Past County Commander of the Burlington County American Legion, a World War I, United States Army veteran; my maternal grandfather the late Legionnaire Edward B. Cliver (American Legion Post #526 - Southampton, NJ), a World War II, United States Army veteran; and, my father Legionnaire Francis B. Hicks (American Legion Post #526 - Southampton, NJ), presently serving as the Post Commander of Post #526, and a Vietnam War, United States Air Force veteran. It is because of these three (3) veterans and their honorable military service that I am eligible for membership in The Sons of The American Legion. Speaking of these three (3) veterans in my family, their honorable service is prominently reflected on my Detachment Commander's lapel pin this year. My pin is shown at the top of this page. The three (3) stars at the top of my pin represent the three (3) veterans in my family that earned my membership in the SAL. So wherever I travel this year as Detachment Commander, those three (3) veteran family members travel with me and gently remind me of my purpose in this organization. S.A.L. - "Service, Ancestry, Legacy"
Legacy - It's OUR personal SAL STORY, how we hope to be remembered in a positive light, well into the future. It my desire as Detachment Commander that this basic theme of "S.A.L." will be the driving force in everything that we, as SAL members, say and do this year. Before we say or act on something, briefly pause and reflect if our words and deeds will live up to the principles of "S.A.L." The golden cord wrapped around the circumference of my pin is symbolic of a united Detachment organization; a brotherhood working together for the common good of our veterans, communities, state, and nation. Placing our personal differences aside for the betterment of our Detachment. Prominently displayed in the center of my pin is our SAL emblem. It was centrally located on the pin to draw attention to the identity of our organization. The symbols of our country and state, the American flag and New Jersey flag, flank the SAL emblem to give honor and respect to both our national and detachment headquarters. To finish off the pin design, I personalized it at the bottom with my name and term of office. If you would like to have my pin to proudly wear on your lapel or Legion/SAL cover, please contact any of the Detachment Vice Commanders or myself. We will be glad to give you a pin! For details on how these goals will be achieved, please refer to their respective pages on our Detachment website. If at any time throughout the 2018-19 SAL administrative year, you would like me to visit your local American Legion Post, American Legion Auxiliary Unit, SAL Squadron, and/or County organization, please feel free to contact me. Visitation requests will be honored on a first come, first served basis, hinged on availability. All requests will be properly considered. If the Detachment Commander cannot attend an event for whatever reason, all efforts will be made to supply a Detachment Vice Commander in his place. See my contact information below to request a visit. As the year progresses, I will post my Detachment Commander's Activities Report here for your awareness. This report will capture the places and events that I have traveled to within a specified timeframe. Please be sure to check back frequently for updates. 8th - Election & installation as 2018-19 Detachment Commander at 57th Annual NJ SAL Detachment Convention in Wildwood, New Jersey. Attended The American Legion Family, Department of New Jersey, Presiding Officers Champagne Toast and Reception at the Wildwoods Convention Center. 9th - Past Detachment Commanders' Breakfast and Wrecking of 2017-18 Past Detachment Commander C. David Page at Rusty Rudder Restaurant in Wildwood, NJ. Marched in The American Legion, Department of New Jersey, Centennial Convention Parade in Wildwood, NJ. 16th - Attended and supported the "Day at the Races" CWF fundraiser hosted by SAL Squadron #338 - Leonardo, Monmouth County, at the Monmouth Park Racetrack in Oceanport, Monmouth County. 17th - Helped check-in statesmen at Jersey Boys State at Rider University in Lawrenceville, Mercer County; followed by lunch, and then observed the Opening Ceremonies. 21st - Attended New Jersey's Mission of Honor 29th Committal Ceremony at Brigadier General William C. Doyle Veterans Memorial Cemetery in Wrightstown, Burlington County. 22nd - Attended Family Day at Jersey Boys State at Rider University in Lawrenceville, Mercer County; and then observed the Closing Ceremonies. 23rd - Enjoyed a breakfast hosted by SAL Squadron #286 - Pine Hill, Camden County. 23rd - Assisted with a BBQ at SAL Squadron #128 - Teaneck, Bergen County, for the pleasure of Paramus Veterans Memorial Home residents. 24th - Attended and gave remarks at the 69th Annual American Legion, Department of New Jersey, High Point Memorial Services at High Point Veterans State Park, in High Point, Sussex County. 26th - Participated in SAL National Vice Commander Ken Warner's (PA) Eastern Region teleconference. 29th - Attended a fundraiser, "Loud Friday Returns," at American Legion Post #346 - Neptune, Monmouth County, to support recovery efforts for the Post after recent flooding. 30th - Attended The American Legion Family of Post #526 - Southampton, Burlington County, picnic at Bamboo Gardens located in Vincentown, Burlington County. 30th - Attended July 4th Celebration Picnic at American Legion Post #348 in Brick, Ocean County. 1st - Helped compile the 2017-18 NJ SAL Detachment Consolidated Squadron Report (Sq. #9999) at American Legion Post #346 in Neptune, Monmouth County. 3rd - Assisted with the membership drive/donation table for SAL Squadron #352 - Somers Point, Atlantic County, held at the Somers Point ShopRite grocery store. 4th - Participated in the POW/MIA flag raising ceremony held at Brightview Retirement Community in Mt. Laurel, Burlington County, coordinated by American Legion Post #526 - Southampton, Burlington County. 7th - Attended and supported the "Jo-Jo Run" fundraiser at SAL Squadron #253 - Spotswood, Middlesex County. 8th - Attended the installation of officers for The American Legion Family of Post #266 - Neptune, Monmouth County. 10th - Installed the 2018-19 Officers of the Burlington County SAL Committee held at American Legion Post #294 in Pemberton, Burlington County. 11th - Captured Department and Detachment endorsement letters at American Legion, Department Headquarters in Trenton, Mercer County, for Gary P. Nelson, PDC, seeking the high office of SAL National Vice Commander and subsequently mailed said letters to SAL National Adjutant Anthony W. Wright (PA). Receipt confirmed. 13th - Attended and helped throw out the first pitch at The American Legion, Department of New Jersey, Centennial Celebration at the Lakewood BlueClaws baseball game in Lakewood, Ocean County. 14th - Paid respects to the late NJ SAL comrade and Legion Rider Paul F. Hendry of Squadron #372 - Cherry Hill, Camden County, and Chapter #281 - Chews Landing, Camden County. Viewing held at Glad Tidings Assembly of God Church in Mount Ephraim, Camden County. 14th - Attended and placed a wreath at the 90th Annual Captain Emilio Carranza Memorial Service in the Wharton State Forest in Shamong, Burlington County. Afterwards, enjoyed lunch and Mexican cultural entertainment at Seneca High School in Tabernacle, Burlington County. 15th - Helped setup The American Legion & Sons of The American Legion, Burlington County Committees' membership drive/donation table at the Burlington County Farm Fair in Columbus, Burlington County. 17th - Attended the monthly meeting of SAL Squadron #253 in Spotswood, Middlesex County. 19th - Attended the "Commemorative Wreath Presentation Ceremony" hosted by the Korean War Veterans, Department of New Jersey, at the New Jersey Korean War Memorial in Atlantic City, Atlantic County. At the ceremony, Miss Hannah Y. Kim presented a wreath as part of her 50 state, 70 city, 90 day journey to visit all of the Korean War Memorials across the country. Her trek began on April 27th in Los Angeles and would end on July 27th in Washington, D.C.
19th - Manned The American Legion & Sons of The American Legion, Burlington County Committees' membership drive/donation table at the Burlington County Farm Fair in Columbus, Burlington County. 21st - Marched in the parade, gave remarks and helped place a wreath at the 22nd Memorial Service for the 29 United States Colored Troops buried in Rahway Cemetery, Rahway, Union County. 21st - Attended Leonardo American Legion Family Post #338's Annual Clam Bake held at the Post in Leonardo, Monmouth County. 22nd - As the NJ SAL Liaison, attended The American Legion, Department of New Jersey, Centennial Committee meeting held at American Legion Post #346 in Neptune, Monmouth County. 26th - Attended NJ SAL Detachment Finance Committee meeting with Department Office staff at Department Headquarters in Trenton, Mercer County. 27th - Attended the ceremony remembering the 65th Anniversary of the signing of the Korean War Armistice held at the New Jersey Korean War Memorial in Atlantic City, Atlantic County. Ceremony was hosted by the Korean War Veterans, Department of New Jersey. 29th - Attended Veterans Haven South Annual BBQ, sponsored by The Sons of The American Legion, Detachment of New Jersey. 31st - Attended a meeting with Department SAL Committee Chairman Norman R. Marlin, Jr. at American Legion Post #184 in Wildwood, Cape May County. 2nd - Visited The American Legion, Department of New Jersey, Headquarters in Trenton, Mercer County, to discuss SAL business. 4th - Helped man SAL Squadron #352's (Somers Point, Atlantic County) fundraising table at Boscov's Department Store in Egg Harbor Township, Atlantic County. 4th - Presented a 100% Yellow Membership Ribbon to SAL Squadron #8 in Clifton, Passaic County. 4th - Enjoyed a Roast Beef Dinner at SAL Squadron #227 in Totowa, Passaic County. Asked to draw the winning ticket for their raffle basket. 5th - Attended the NJ SAL, Detachment Mentoring Committee meeting at American Legion Post #262 - Audubon, Camden County. 11th - Enjoyed delicious food and camaraderie at the NJ SAL Detachment Officers, Chairmen, and PDCs Barbeque hosted by NJ SAL Past Detachment Commander Nicholas J. Wingler at his residence in Bayville, Ocean County. 11th - Attended the Surf & Turf Bash hosted by The American Legion Family of Post #148 in Hightstown, Mercer County. Assisted NJ SAL Past Detachment Commander C. David Page make two (2) presentations to SAL Squadron #148. 12th - Helped distribute Walmart gift cards, purchased by the SAL Detachment of New Jersey, to the residents of Veterans Haven North in Glen Gardner, Hunterdon County, as a small token of our thanks for their military service. 17th - Visited The American Legion, Department of New Jersey, Headquarters in Trenton, Mercer County, to discuss SAL business. 18th - Attended The Sons of The American Legion, Detachment of New Jersey, regular Detachment meeting at the War Memorial Building in Trenton, Mercer County.